Derived Class that uses this class as a base. T Type of controlled resource. This class serves as a base for its template parameter as implied by Curiously Recurring Template Pattern. This class factors out creation of a cleanup handler. The latter requires knowledge of the current recovery context, which is provided by this class. Definition at line 145 of file CrashRecoveryContext.h. Definition at line 148 of file CrashRecoveryContext.h. x Pointer to the resource recovered by this handler. New handler or null if the method was called outside a recovery context. Definition at line 156 of file CrashRecoveryContext.h. 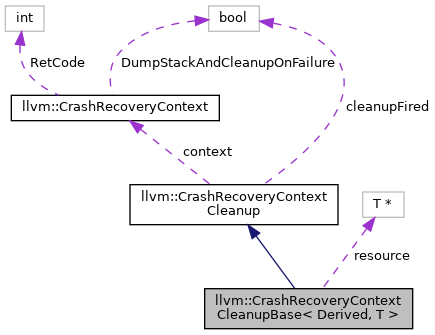 Definition at line 147 of file CrashRecoveryContext.h.